As the sun has finally arrived and the summer holidays are fast approaching you may need some ideas of what to get up to. The local classes we usually go to have stopped for 6/7 weeks so we will be finding other fun things to do. Some ideas are also great for when the weather isn't so great. 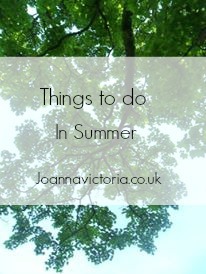 I hope this post has been helpful to you and have given you some ideas for the summer holidays. I'm going to try and do as many of these as possible to make most of the summer. You've reminded me that we've yet to go strawberry picking!!! we will be going to a few national trust sites over summer - our passes end at the end of August!! We have done almost 1/3 of the list. Still long way to go to complete it all. Would like to accomplish it all. Those are pretty much all on our list! The kids break up on Friday for the holidays so need to keep them busy! I will for the 1st time ever be working part time during the holidays so will definitely be making the most of my days off with the kids!! Great post!! Love a good list! Lots of fun suggestions here! I've just been writing a post like this but specifically for kids as my little two just wrote their own summer to do lists, very cute! I love your list, especially National Trust, they are our favourite day out! Loving the activities listed here. I have quite a lot planned out for summer. that is a handy check list to tick off too! I've been going to the beach a lot lately; such a cliche for summer but it always goes down a treat! A good list - we were just talking about making one for the holidays. What a great list of things to do this summer! I still need to go swimming! I really need to draw up a list for this summer, as extra motivation to get out and do stuff! Blowing bubbles and then shooting them down with water pistols is a favourite of mine! There really is so much to do. I'm so looking forward to school hols with my little boy. We are trying to make the most of the sunny days by going on lots of long walks. That's a great list with stuff to do in summer. I love going to the beach and also having bbqs in the evening. YAY to the sun! Finally it's summer time and there's so much to do. Some great ideas and I'm already doing many of them such as reading and going to the parks and hopefully going to the beach tomorrow - exciting! You have listed two of my favourite things to do - read books and go camping - I love spending time relaxing on a campsite. Swimming is one of my favourite pastimes, especially if I can combine it with going to the beach. This is a great post, I will be doing many of these too so I can tire out the little ones. These are all great ideas! I'm happy to see I've already done quite a few of them :) I'm determined to make the most of this weather! Great list! There's so much to do in summer that it's hard to fit it all in. I keep meaning to write our bucket list! You've picked some good ones to do.